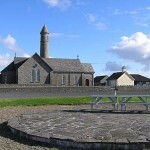 Our Lady Star of the Sea Church at Quilty came into being as a result of extraordinary circumstances. This was when a large French freighter, Leon XIII (named after Pope Leo), foundered in stormy weather off the Clare coast in 1907.Crews of local fishermen risked their lives to save all on board. On the first day of the attempted rescue they were unable to launch their canvas canoes. On the next attempt they were successful and brought some of the crew ashore. The Captain with broken leg and the few remaining members of the crew were taken off the next day by a naval vessel from Cobh. This dramatic episode and the heroic deeds of the fishermen was publicised internationally. It is true to say that out of misfortune springs new hope. It became known that for years Quilty had been in want of a church which the poverty of these same fishermen had been unable to provide. A fund was set up firstly for the material needs of the fishermen themselves and another for the building of a chapel. A site was given by Mr. Richard Haren for the chapel. Designed in hiberno-romanesque style by architect Mr. Joseph O’ Malley B.E. of Limerick and his assistant Mr. Burke (or O’ Rourke in some records) gave of their time and talents freely for the “sake of those brave men”. The contractor was Mr. John Ronan of Kilrush. The foundation stone was laid in July 1909 by Dr. Fogarty, Bishop of Killaloe. The stone was quarried and sand drawn by the local people in the Spring months even when their livelihood depended upon taking and saving of seaweed. The quarry and sand pit were given free of charge by Messrs. Brew, J.P Kilrush and Kelly, Ennis respectively. It included a round tower belfry which was intended to serve as a landmark which could be easily seen by the fishermen at sea. The stones for the tower were quarried from Mr. P. Talty’s quarry at Caherush. The Church was refurbished in 1975/6 by Limerick architect Thomas McMahon and local builder J.J. Morrissey, Quilty. The refurbishment included a new roof, new flooring, new sanctuary, new plastering and painting of internal walls and provision of central heating and new electrical installation. Copyright 2011 Kilmurry Ibrickane Parish All Rights Reserved.